Retrospective showcases the work of the late artist and alumna Sherry Zvares Sanabria. "Umbria Stop," a painting by alumna Sherry Zvares Sanabria, who died last March. A retrospective for the painter is being held at GW. Painter Sherry Zvares Sanabria, B.A. ’59, had a knack for finding spaces that held profound meaning. She traveled throughout the world, to asylums, immigration centers and prisons. Then she’d paint images from those locations in warm, velvet-like colors that marked her signature. The painter and GW alumna died of illness in March 2014. Now, a compilation of her work is being displayed in a retrospective show organized by her husband, Robert Sanabria. The exhibition will be open to the public at the George Washington University’s Virginia Science and Technology Campus through the end of August. Mr. Sanabria worked with Ms. Sanabria's daughter and son to put the retrospective together. Ms. Sanabria’s alma mater seemed like the right place for it, and the Virginia campus near her home was dually meaningful. For the show, Mr. Sanabria found early sketches Ms. Sanabria had tucked away in their home, and he paired them with examples of her later, more refined style. Sherry Sanabria's Ellis Island Cashier's Window #2. “Sherry was a naturally gifted draftsperson, drawing naturally and accurately. So I found some of these drawings and also some early paintings to show a broad spectrum of her work,” he said. He met Ms. Sanabria in 1975 as one of the organizers of D.C.’s Touchstone Gallery. Laughlin Phillips, who offered Ms. Sanabria a solo exhibition at the Phillips Collection, noted her first show at the Touchstone. She would go on to have 30 one-person shows in both public and private spaces, including the Ellis Island Immigration Museum and the American Institute of Architects. Ms. Sanabria paid special attention to buildings that were significant in history and in people’s lives: She visited concentration camps in Austria and East Germany, and slave quarters throughout Virginia, Maryland, Georgia and Louisiana. She captured halls in Alcatraz and tombs in India. 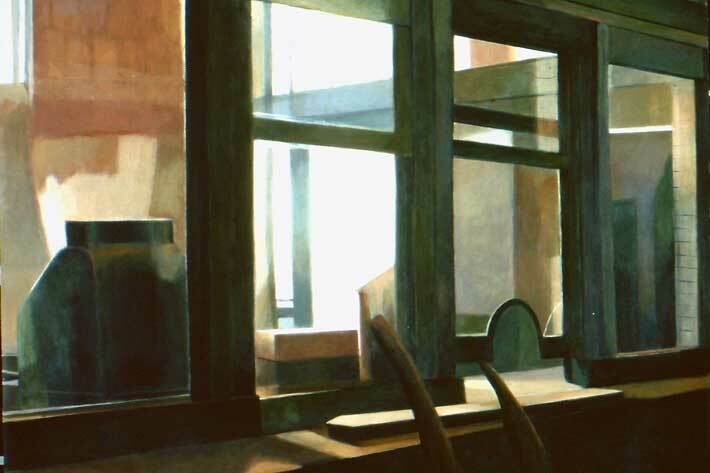 “One has a sense in an old building that there were many people that had passed through and by it,” she said at a lecture in 2013, explaining her painting philosophy. 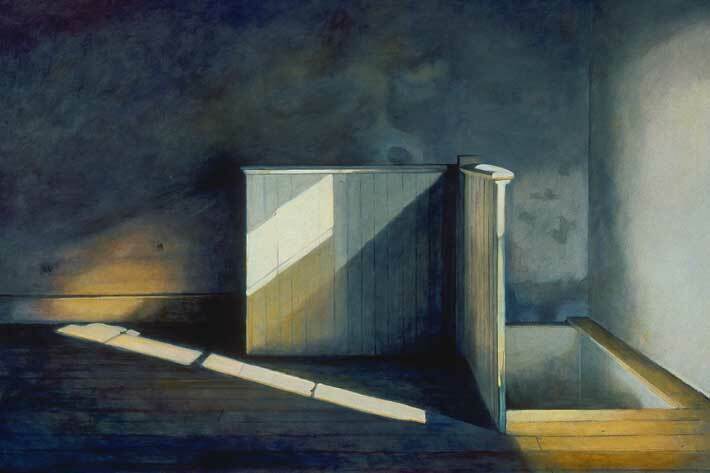 In the retrospective at GW, visitors can take in Ms. Sanabria’s technique and exploration of architectural angles and light. The show includes paintings from one of her final trips to the Italian region of Umbria, and a piece inspired by the Oatlands mansion in Virginia—one of Mr. Sanabria’s personal favorites. Mr. Sanabria is an artist, too, and the couple worked alongside each other for decades. Her studio was right above his and she’d often bounce down the stairs to give him her thoughts on his sculptures. He would help her paint perspective, something he’d studied at the Corcoran College. The pair even worked together to build the house where they lived. It was always a partnership, Mr. Sanabria said, never a rivalry. He remembered a Washington Post article that admonished artists from marrying each other because they would compete. “That didn’t happen with us. I was a sculptor, she was a painter, and so we weren’t doing the same kind of work to begin with. And my attitude was always to promote her career,” he said. And that’s what he’s continuing to do in this latest exhibition. The show will run until Aug. 31 in Enterprise Hall.